DePetro.com: Rhode Island Democrat Town " Brawl"
Rhode Island Democrat Town " Brawl"
Where have you gone Joe Garrahy? 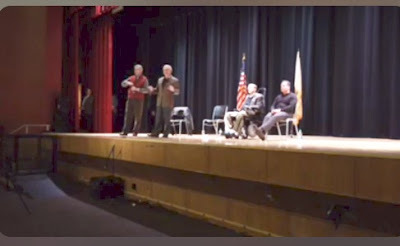 With seething anger and disgust not seen since the state banking crisis, the Rhode Island Democrat congressional delegation attempted to hold a "Town Hall" which turned into a standing room only "mob" of 900 socialists and Elizabeth Warren supporters that screamed for over 90 minutes in the auditorium at East Providence high school. 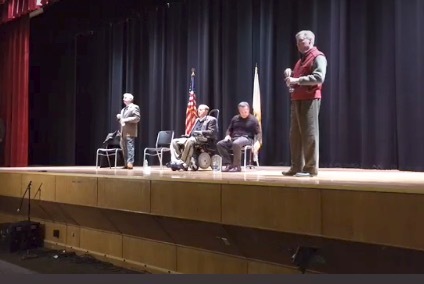 On stage were Senator Jack Reed, Senator Sheldon Whitehouse, Congressmen Cicilline and Langevin. In an unprecedented display of anger at members of their own party, the crowd yelled against President Trump and threatened the senators to just " vote no" on everything Trump. One woman screamed at Whitehouse over "rule 19" and his silence regarding Elizabeth Warren. One man demanded Senator Reed begin impeachment proceedings against President Trump. Speaker after speaker identified themselves as members of the " Rhode Island Socialist Party," or the " Providence Socialist Party." The crowd booed when the senators tried to explain they must follow the constitution and the rule of law. 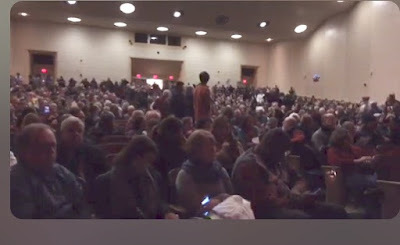 One by one, the crowd would proceed to the microphone and demand Reed and Whitehouse remove Trump due to the "crisis" happening in the country. One speaker demanded they stop federal funding for the 6/10 connector and halt more money for infrastructure. Senator Reed explained money is needed to keep our roads and bridges from falling down or highways from collapsing. Some in the crowd demanded weekly meetings be held with the public until President Trump is removed from office. This was not the "1025 club" crowd of Rhode Island Democrats, but more of a delusional crowd of " Occupy Wall Street" socialists on steroids. To their credit, the delegation kept their cool. It was hard to discern was this was an all Democrat delegation facing a room of democrat constituents. In one dramatic emotional moment, Senator Reed told the crowd that at age 17 he enlisted in the army and swore to follow and uphold the laws of the United States. One arrogant participant challenged Reed to force Trump to resign so they could start the " National Unity Party." Follow the latest right here on DePetro.com and listen to the John DePetro show afternoons from 1:00-5:00 pm on 1540 AM. Will Rhode Island forgive Queena Raimondo?